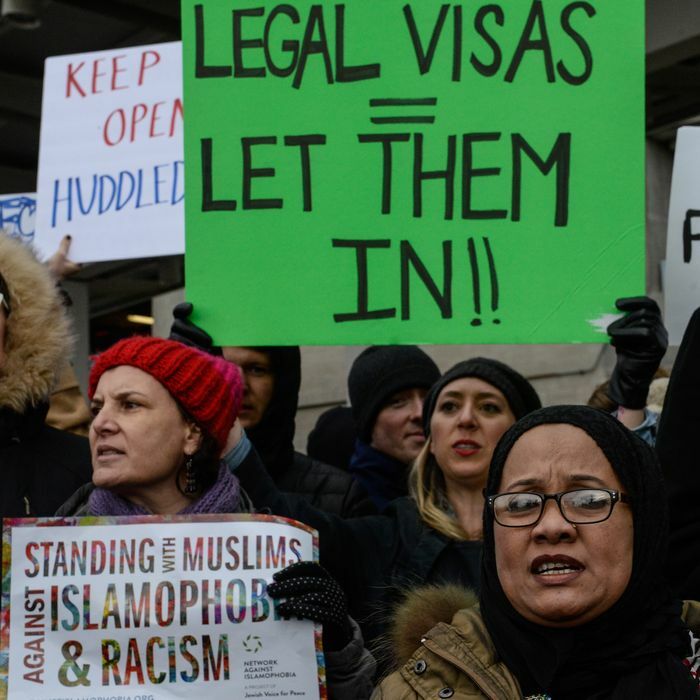 The case that halted President Trump’s initial travel ban less than two days after he signed the executive order has been settled, and under the terms, those blocked from entering the U.S. will get a chance to reapply for visas. Shortly after the ban — which temporarily blocked refugees and people from seven Muslim-majority countries from entering the U.S. — sparked protests at airports nationwide, President Trump claimed on Twitter that “Only 109 people out of 325,000 were detained and held for questioning.” Documents newly obtained by the American Civil Liberties Union show there were actually 2,000 detained during the 26.5 hours the order was in effect, from January 28 to January 29. Roughly 140 were denied entry and sent back to their country of origin. Two Iraqi nationals, Hameed Khalid Darweesh and Haider Sameer Abdulkhaleq Alshawi, filed a lawsuit after being detained a JFK Airport, and the next day a federal judge issued a temporary injunction. Because it was a class-action suit, the injunction prevented the order from being enforced across the country. This week, the case was quietly settled in a Brooklyn courtroom. Under the terms, the federal government must send a letter to every person who was blocked from entering the country due to Trump’s executive order, notifying them that they’re eligible to reapply for a visa. There’s no guarantee that applicants will be admitted, but the Department of Justice will designate a liaison to review their applications for the next three months, using the normal criteria for admission. Parts of President Trump’s revised travel ban were allowed to go into effect in June, and the Supreme Court will hear oral arguments on the case in October.